At fifty-three, Rosen was celebrating his thirtieth anniversary as a retailer. 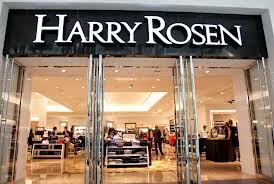 He and his brother, Louis Rosen, opened the first Harry Rosen Men’s Wear shop at 407 Parliament Street near Gerrard in 1954, on $500 borrowed from a cousin. Today  the company extends over a network of 24 stores across Canada, operated by a staff of about 475 employees. Rosen attributed the handy growth of his company to his partnership since 1975 with Dylex Inc., whose principal shareholders are James Kay and Wilfred and Irving Posluns. But he also admits his own flair for fine tailoring had something to do with it. He adds that he inherited his entrepreneurial sense from his father, Abraham, An immigrant from Lodz who is now eighty, Abraham Rosen began on Baldwin Street as a horjse-and-wagon rag peddler and later operated a flourishing metal junk yard in Callander, Ontario. Harry quit Harbord Collegiate as a teenager for a $40-a-week job as a pocketmaker and machine tailor at Tip Top Tailors on Fleet Street. Later he learned the retail side of the business from his mentor, Sam Lebo.